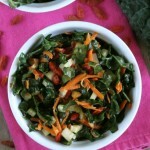 Healthy kale salad made with goji berries, roasted almonds in a maple dressing. 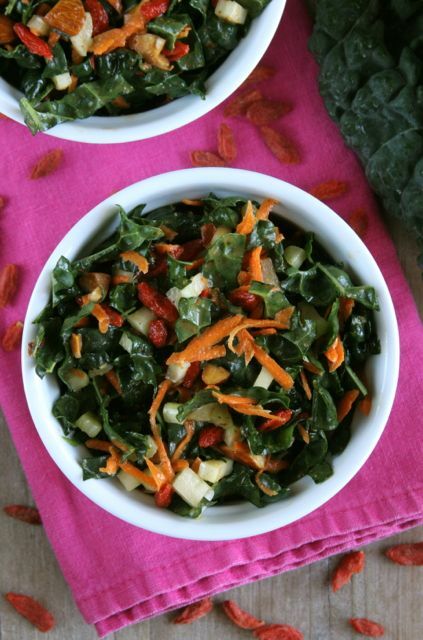 In a large bowl, combine the kale, celery, shallot, carrot, goji berries, and almonds. In a small bowl, whisk together the vinegar, olive oil, maple syrup, and almond butter. Pour the dressing over the salad and toss to coat. Season to taste with salt and pepper. Allow the salad to stand at room temperature for at least 15 minutes before serving, or refrigerate in an airtight container for up to 2 days. For the almonds: Preheat the oven to 375ºF. Line a baking sheet with parchment paper. Combine all of the ingredients in a small bowl and stir to coat. Spread the almonds out in a single layer on the baking sheet. Roast for 10-12 minutes until fragrant and lightly browned. Cool completely before using.